The Nashbar 4050 is a vintage steel road bike from 1988. I picked this up from a local thrift store in May 2016. They told me it had been in a storage locker for years. It was in pretty rough shape, so much so that I couldn’t even test-ride it. But it was cheap, so I grabbed it. It’s a pretty basic bike, but has some interesting features. The frame material is plain-gauge chromoly lugged steel. The lugs are simple, not ornate. The bike’s model name is based on the groupset: SunTour AccuShift 4050. It’s “signed” by Arni Nashbar, the owner of Bike Nashbar, the mail-order discount bicycle catalog. The frame color is very, very yellow. When you look closely, it has some sparkle in it. I’m still trying to decide if I like the color. 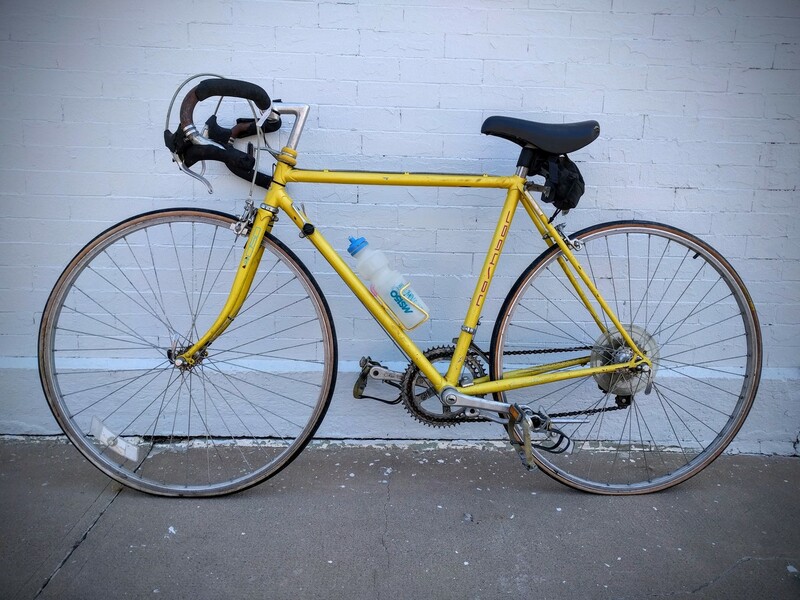 Pretty much immediately, I swapped out the tires, saddle, chain, and pedals. I hate those old brake levers with the cable coming out the top, so I swapped in some Tektro RL340 brake levers, re-routed the cables a bit, and re-wrapped the bars. Surprisingly, that was all it took. The drivetrain was good, shifters worked (though I switched them over from indexed to friction), brakes worked, and the wheels were good enough. The bike fit me pretty darned well. After about 1800 miles, I took the rear wheel off one day, and the rear hub came apart in my hands — the axle had broken! Rather than trying to repair it, I swapped in some 700c wheels, which I’d been meaning to do anyway. The brakes had enough adjustability to handle the slightly smaller wheels, so it was an easy swap. 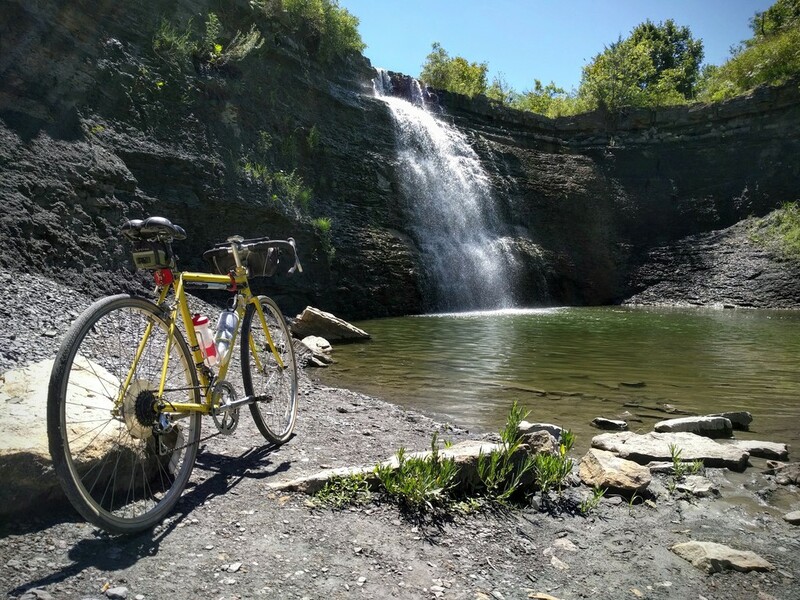 Nashbar 4050 at the Bourbon State Fishing Lake waterfall. 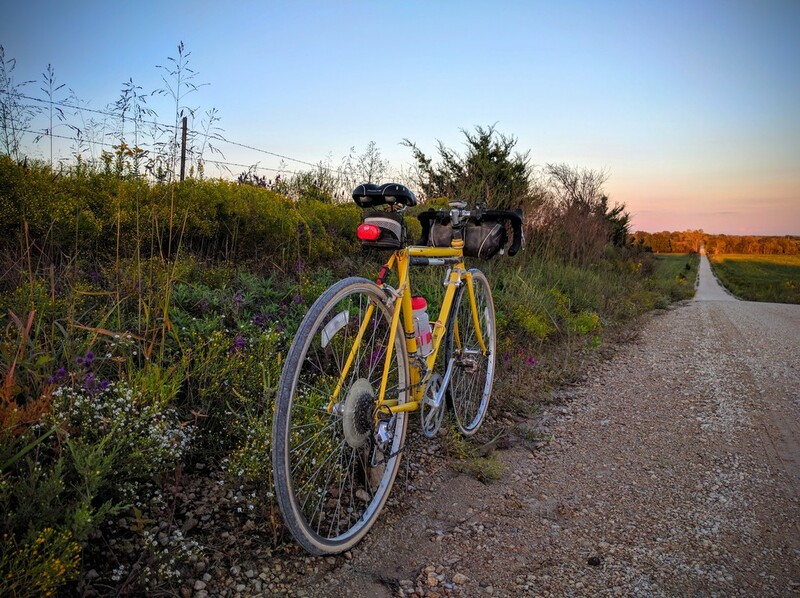 Nashbar 4050 on a gravel road. 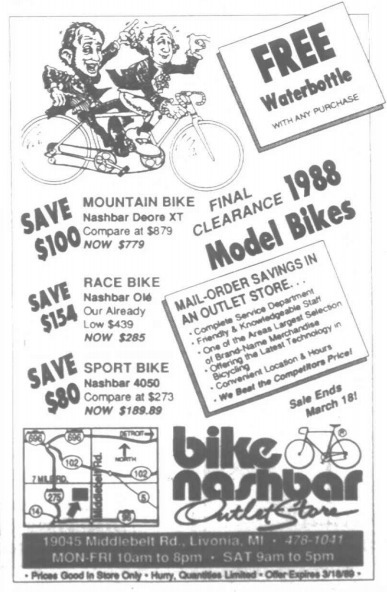 Nashbar Outlet Store newspaper ad from 1989, offering the 4050 at $189.99, a discount on the $273 list price.